A look at why investors can expect a better second half for the U.S. economy, based on ISM data. The services industry got a boost recently with the news that a highly regarded barometer of its performance came in with strong numbers. The latest Institute for Supply Management, or ISM, non-manufacturing data indicates a pickup in service industries growth in July. The ISM non-manufacturing data is complied from an anonymous questionnaire that goes out to 375 purchasing executives in the U.S., and is widely respected as one of the most important economic indicators available to investors. Given that any reading greater than 50 indicates expansion in the economy, investors must have been particularly pleased to see the headline non-manufacturing Purchasing Managers' Index, or PMI, come at 58.7, with business activity at 62.4 and new orders surging to 64.9 -- all three numbers indicate strong growth. In fact, the headline number is an all-time high. There is no doubt that services growth is gaining momentum; can investors conclude that the second half of 2014 will see stronger growth in the U.S.? Here are four reasons why the answer to that question should be "yes." While the ISM non-manufacturing data covers nearly 90% of the U.S. economy, the organization's manufacturing data has a longer history of being used as a benchmark for the economy. The good news is that both ISM surveys are moving in tandem, a sign that recent strength isn't restricted to one part of the economy or driven by particular strength in any one industry. 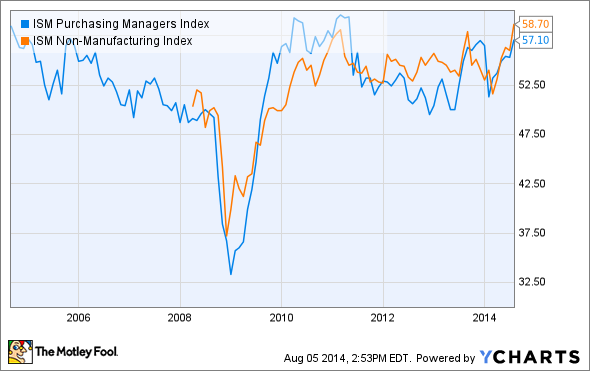 ISM Purchasing Managers' Index data by YCharts. As the chart above demonstrates, the two indices tend to move together, but there are periods of divergence, most notably in the last quarter of 2013. The fact that both indices declined dramatically in the first quarter of 2014 indicates that the severe winter weather (rather than any underlying deterioration) did have a strong effect on the economy. Focusing on the ISM manufacturing data for the moment, the following chart demonstrates that the new orders component tends to lead the headline PMI data. The new orders data suggests that manufacturing growth is going to come back strongly in future months. In addition, it looks as if underlying growth is strong in the economy, because the data is picking up from where it left off in the latter half of 2013. Moreover, growth in manufacturing was broad-based last month, with the ISM survey noting that 17 of the 18 manufacturing industries reported growth. The latest factory orders data from the Commerce Department also indicate growth. Manufacturers' new orders (excluding the volatile transportation sector) came in with 1.1% year-over-year growth in June, while durable goods orders increased 1.7% on the year. Durable goods are usually seen as more reflective of the manufacturing economy at large. Moreover, cyclical sectors machinery and computers and electronic products both recorded 2.9% growth -- a good sign for future growth. 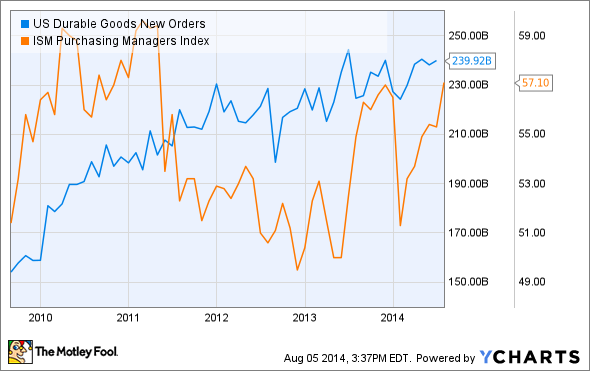 Again, the following chart demonstrates the recovery in durable goods orders after a weak start to 2014. It backs up the ISM manufacturing data. US Durable Goods New Orders data by YCharts. Finally, the ISM data is backed up by anecdotal evidence from companies. For example, aluminum producer Alcoa (NYSE:AA) recently gave an upbeat assessment of global industrial conditions, which investors can read about here. Emerson Electric (NYSE:EMR) also served notice of its expectation that its second half of 2014 will improve upon a disappointing first half.. For example, its order growth came in at 9% in the second quarter; more on that here. Finally, Caterpillar (NYSE:CAT) recently increased its full-year construction machinery sales forecast, which projects 5% to 10% growth. All told, the latest ISM data reflects a stronger economy in the U.S. Granted, it's not clear yet if this is merely a bounce back from weakness in the first half adversely affected by weather. However, the underlying data and anecdotal evidence suggest that U.S. growth remains on track in 2014. Leading indicators such as new orders demonstrate ongoing strength, and some of the more cyclical areas of the economy are starting to see spending again.